Yes! This thread will never die. It's the Gravecrawler of cardsmith threads. Maybe I'll get around to making an entry this time. It grinds to a halt when nobody's interested in the song choices offered. We all just wait until someone else makes one, then check the new list. I just tend to get annoyed by the meme videos. But I admit variety is a good thing. @Biblio4 - I like the challenge of trying to find at least one inspiration within the song choices. Sometimes it's an uphill climb! 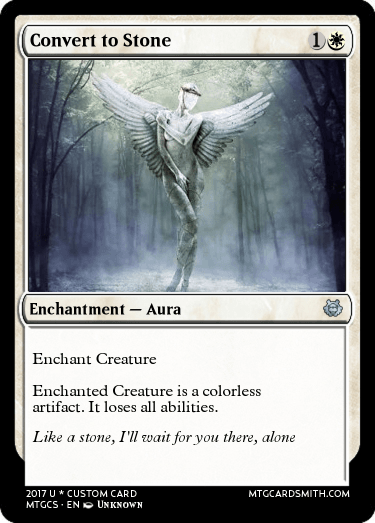 Hopefully the art is not too risqué for cardsmith, although I thought it would be fine since it's, you know, a statue. No problem as it just looks like the artifact clone cycle, particularly Clone Shell. Trying to think of something for the song Canadian Idiot, but I'm having issues finding something distinct in regards to artwork. Something that fits the MTG art theme. I dunno, I'm kinda partial to that Rock song! The Canadian Idiot song is just one of the better meme/joke songs uploaded that's all. I know that this song could be interpreted much sillier on a card, but I tried to take it as seriously as possible.